Where on earth has August gone? I swear it only just started, and now it’s the last full week. I suppose that’s good in a way, because now we’re nearly to fall! This will be my first “real” fall in over a decade, with changing colours and everything. I dragged my Hitchhiker out of hibernation a couple of weeks ago. I hadn’t realised how long I’d been ignoring it until I noticed it was late August. We moved up here in March, and I hadn’t spent much time with the wheel since unpacking it. The other day, though, I noticed that my spinning mojo had returned with my knitting mojo. 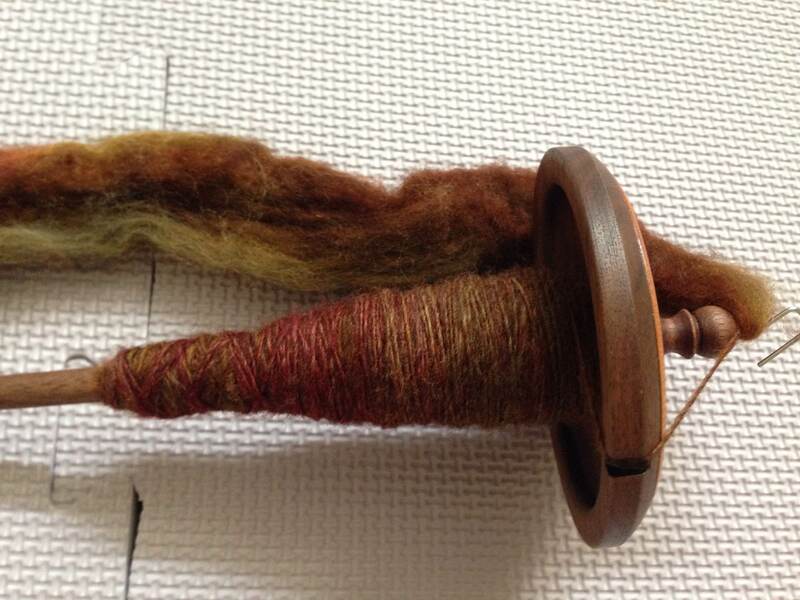 I’d been working on a drop spindle for a couple of weeks, but I had an itch to start up on the wheel again, too. My single is still pretty uneven, but I’m basically relearning how to spin on a wheel. I was never great at it, so I thought a good place to start was with a class. I am taking the Spinning Yarn for Beginners: Foundations in Spinning Class by Amy King on Craftsy. I am really enjoying it so far. Amy King does a great job of explaining the parts of the wheel, different styles of wheels, fibers, and how to get started. I particularly like the “games” she has you do to get used to the motions. I definitely recommend the class. As you can see, my bobbin is far from full. I get so frustrated with the wheel that I end up picking up the spindle again to have a “win.” My biggest problem has been the fiber breaking on me. I’m also having trouble getting used to the foot movements. My hitchhiker is a single treadle, and I almost wonder if I wouldn’t have an easier time with a double treadle, so at least both feet are doing the movements. I don’t know. We’ll see. 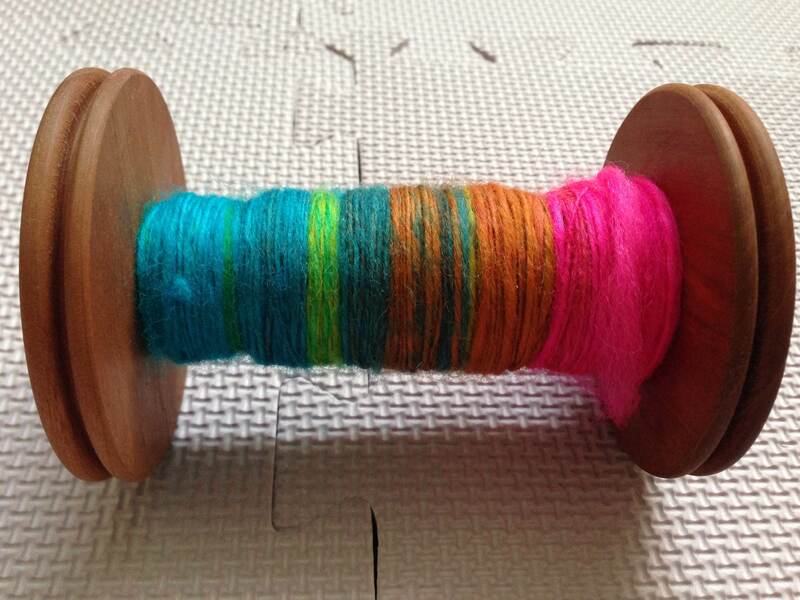 My time on the spindle is going much better. Slowly but surely my singles are becoming more even. I’m working with a gorgeous fiber, which I believe is a merino/yak blend (don’t quote me; I can’t seem to find the tag). I bought it a few months ago from Unwind Yarn Company. It’s so wonderful to spin. The spindle below is my second one. I split the fiber in two and am going to ply it together. I have no idea what I’m going to make yet, but I’m enjoying the process. I’ve also been a sock fiend! Ken’s socks are finally off the blockers. I still need to finish weaving in the ends, but after that, they’re good to go. 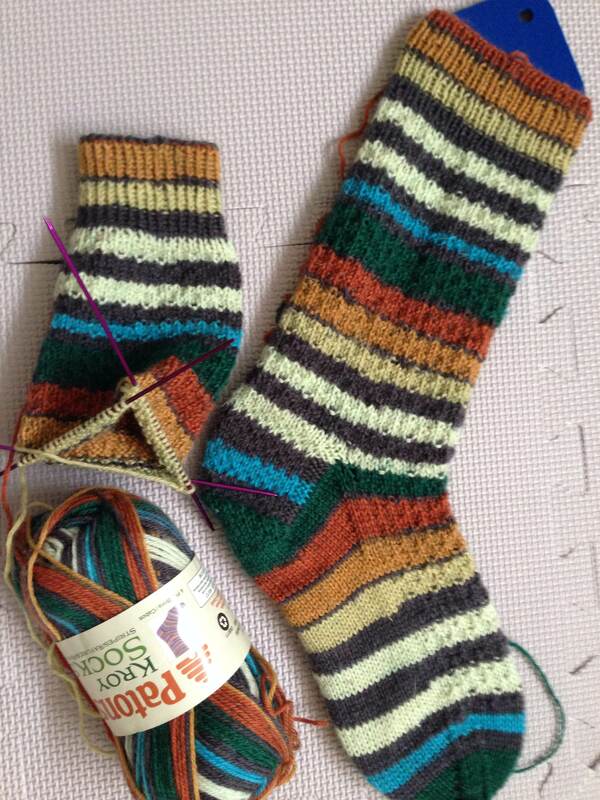 Last weekend I cast on a pair of Hermione’s Everyday Socks by Erica Lueder. Everyone seemed to be knitting these, so I wanted to see what all the fuss was. Now I get it. The socks are so easy to knit and so quick! I’m usually a toe-up person because I like to know I’m using all of the yarn (or as much as possible), but I have to say, these might just be my new go-to socks. And as for using all the yarn, I only had maybe 2 to 3 yards left from one skein of Paton’s Kroy Sock yarn, which made for quite the stressful race to the end. Still, that works for me. I’d rather not have too many leftovers. I also cast on my Meridian sweater by Cecily Glowik MacDonald. I love this pattern so far. It’s been very easy to follow, and the cable panel down the back was easy to memorise. I only have to check the pattern now and then when I come to the end of a repeat, such as during increases, to see what’s next. Otherwise, it’s stowed away in my bag. I’ve put the sleeve stitches on holders and am now working my way down the body, which is probably the part that’ll take the longest. Although I’m really looking forward to wearing this sweater this fall, I’m in no rush to finish. It’s a pleasant knit, and I’m enjoying the process of working on it. What projects are you working on? Any knits you’re dying to make for the fall? I tried spinning a few weeks ago and I found it fascinating. Yes, I think two pedals does help as you are more balanced at the wheel. I have a Schachts Sidekick and I find I can spin for much longer on that than on my Louet with just the one pedal. Either way your yarn looks gorgeous and very even.